Bronze medallists at the recent Gold Coast Commonwealth Games, the Indian partnership of Harmeet Desai and Sanil Shetty once again proved their worth; on the evening of Wednesday 23rd May, they secured their place in the Men’s Doubles event at the Seamaster 2018 ITTF World Tour Hang Seng Hong Kong Open by overcoming a most creditable partnership. In a nail-biting encounter, they accounted for China’s Zhou Qihao and Zhu Yu by the very narrowest of five games margins (4-11, 11-7, 8-11, 13-11, 14-12). 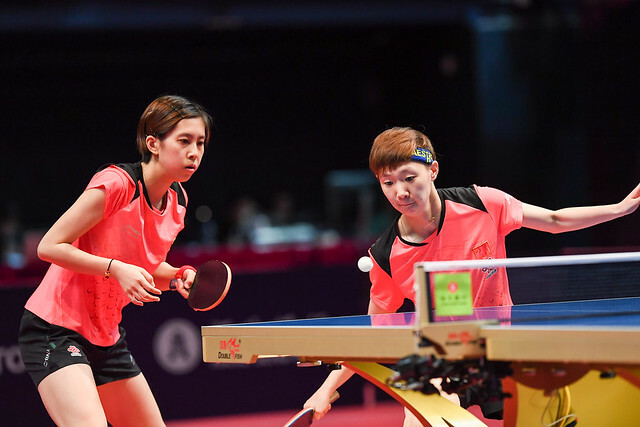 The win may not be earth shattering but when considering the fact that Zhou Yu is a renowned doubles expert, the silver medallist at the Qoros 2015 World Championships in partnership with Fan Zhendong and the Indian partnership is a combination that nearly didn’t happen; it is a result of note. At Gold Coast Commonwealth Games, Harmeet Desai was supposed to partner Soumyajit Gosh but injury forced the latter’s late withdrawal; enter Sanil Shetty who would also seem to be gaining a reputation as doubles master. Last week he was the runner up in partnership with Sathiyan Gnanasekaran at the 2018 ITTF Challenge Thailand Open. Success for Harmeet Desai and Sanil Shetty, alas for colleagues Sathiyan Gnanasekaran and Manav Vikash Thakkar it was defeat at Chinese hands; they were beaten in four games by Zhou Kai and Zhu Linfeng (11-3, 9-11, 11-8, 11-9). Differing fortunes for China and India; it was the same for Belgium. Robin Devos in partnership with Finland’s Benedek Olah beat Korea’s Kim Donghyun and Lim Jonghoon (4-11, 11-9, 11-4, 11-5) to book their main draw place; Cédric Nuytinck in harness with Kou Lei gained a walk-over in opposition to Japan’s Yuki Hirano and Kenji Matsudaira and likewise advanced. Conversely for Martin Allegro and Florent Lambiet it was defeat; they were beaten by Sweden’s Pär Gerell and Jon Persson (8-11, 11-6, 11-7, 11-8). Meanwhile, in the remaining contests to determine main draw places, comprehensive wins were the order of the day. Chinese Taipei’s Liao Cheng-Ting and Lin Yun-Ju beat Russia’s Alexey Liventsov and Mikhail Paikov (12-10, 11-6, 11-9); Iranian brothers Nima Alamian and Noshad Alamiyan accounted for the French pairing of Benjamin Brossier and Antoine Hachard (11-7, 12-10, 11-2). Likewise, former European champions, Austria’s Robert Gardos and Daniel Habesohn ended the hopes if the United States combination of Feng Yijun and Kanak Jha (13-11, 11-8, 11-6. Play in the main draw commences on Thursday 24th May.